As our special two-week premiere continues, Sean dips into his VHS collection and selects the "classic" 1985 Arnold Schwarzenegger vehicle Commando starring Rae Dawn Chong, Alyssa Milano, Vernon Wells, and Dan Hedaya. Talking points: 20th Century Fox Selections. VHS vs. DVD. Evil garbage trucks. John Matrix is a young retiree. Plane plan. Creepy Sulley. Digital watch. Inscrutable evidence. Useful Cindy. Sean's history with Commando. 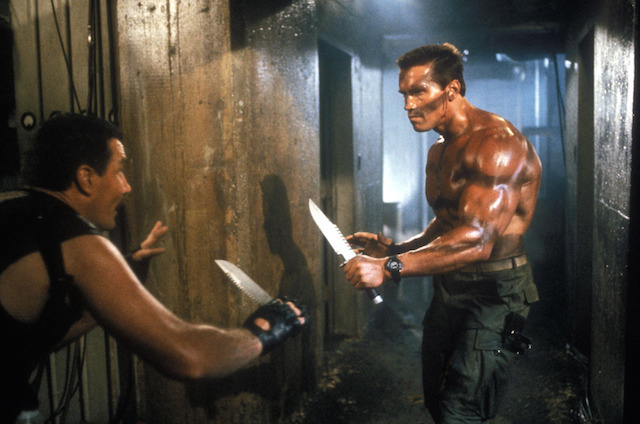 The beauty of 80's action cinema. Climactic island assault. Chainmail sweater. Arnold catch phrases. Commando 2: Die Hard. Is Arnold attractive? Buy it/rent it/tape over it. Jonathan Taylor Thomas. Posted on July 6, 2015 by Tapeheads and filed under Episodes, Sean's Collection, Arnold Schwarzenegger.